I had just published a book called Alien Nightmares which mentioned the wave of UFO sightings in Wytheville, Virginia, in 1987-1988. About a week after the book went live, we left for a road trip from Georgia to New York. Being the navigator it was my job to map out our route and I decided to use interstate I-81 for the main leg of the journey. As I printed out the directions and zoomed in on the various trouble spots we might encounter, I discovered that I-81 would take us directly through the town of Wytheville. This hadn’t started out to be a UFO-related trip. It was supposed to be a visit to see my family in New York, but it soon turned into a much needed vacation in a secluded location on Cayuga Lake, another UFO hot spot from the 1960s which had been highlighted in Alien Nightmares: Screen Memories of UFO Alien Abductions. There was something thrilling about seeing the location of two known UFO flaps, which is the official name for a wave of UFO sightings, and I eagerly awaited our journey through Wytheville. I had hoped to see a UFO skipping across the sky when we stopped just outside of town at a rest area to potty the dogs and have lunch. 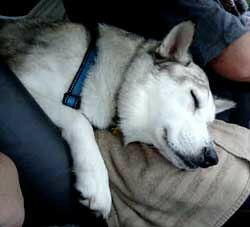 However, our dogs were distracted by the hubbub of a nearby family whose children were drawn to the dogs. Alas, I never once had the chance to look up to the sky in the hopes of a UFO sighting. 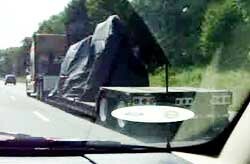 We did notice quite a few oddities while driving through Wytheville which I took note of, and on the return trip I attempted to capture the oddities through photographs such as a truck carrying interesting cargo out of Wytheville. Please pardon the lack of perfection in the photos. We’d driven several hundred miles and I’d never used our camera in this manner, so I had no idea what settings would bring out the best images looking out a dirty window traveling at 70 mph or thereabouts, especially with a white, oval-shaped sticker plastered to my side of the windshield. Starting at the Virginia state line heading south on I-81, the first thing we noticed was a cluster of fairly large satellite dishes pointing in all directions. We were still a ways off from Wytheville as we drove through the Timberville area approximately 192 miles away. We wondered if the satellite dishes had been there prior to the UFO wave of the late 80s, or if they came into being afterward. The next location of interest was Fort Defiance whose origins dated back to the French-Indian War. We were 160 miles from Wytheville which is a long way in human measurement, but a skip in space for a UFO. One could imagine an army of puny humans shaking their fists in Defiance against space aliens roaming the skies overhead. Next came the city of Salem just 90 miles from Wytheville. Other than its name which conjures up witches, Salem has no connection to the Salem Witch Hunts of old Massachusetts in the 1600s. Salem did, however, hold its own claim to fame: it was the location of the sacred God’s Acre burial grounds of the Moravian Church. The original God’s Acre was located in Germany on the “Hill of Watching” at Herrnhut Saxony. With our UFO mindset, the Hill of Watching could only mean one thing — watching for the Watchers. The Moravian Church would undoubtedly disagree being firmly seated in the more traditional teachings from on high. The Moravian Church embraces Christianity with the spirit of happiness, simplicity, fellowship, unobtrusiveness, and the ideal of service. Traditions include the Easter Sunrise Service, Lovefeast, Moravian Advent Star, and others. God’s Acre passed by us and 39 miles from Wytheville was the Radford Army Ammunition Plant, which became active in 2003 in conjunction with the Joint Munitions Command. The plant manufactures explosives and propellants to support tank, missile, field artillery, air defense, aircraft, and Navy weapons systems. Radford is the sole supplier of TNT to the U.S. Dept. of Defense. They chose an interesting location for operations just 39 miles from a wave of UFO sightings. Prior to its connection to the Joint Munitions Command, this was the Radford Ordinance Works and New River Plant as established in 1941. Only a conspiracy theorist could draw a connection to the Wytheville UFO sightings as none of the dates match up. Still, its location was full of intrigue for these fascinated travelers, especially in conjunction with a road sign pointing to Galax, Virginia just 38 miles to the south of Wytheville. Galax was named in 1906 for an evergreen plant long before UFOs flew in from a faraway Galax-y. For us the entire trek through Virginia was a series of secret clues. On the final approach to Wytheville was State Route F-044, an F-series route which designated a frontage road. This particular route started in Wythe County at Fort Chiswell and ran almost to Pulaski, Virginia. Contrary to any UFO conspiracy theory, Fort Chiswell actually takes its name from an old frontier fort built in 1758 during the French-Indian War. Fort Chiswell is considered to be a control city for I-77 at the junction of I-77 and I-81, located at one of the few wrong-way concurrencies in the nation. 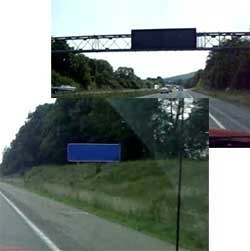 A wrong-way concurrency happens when you are traveling on a road that takes you both north and south at the same time according to the signs, or east and west. 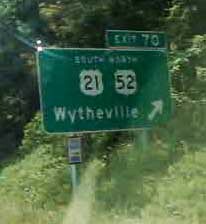 In Wytheville, you can be traveling on I-77 Northbound and I-81 Southbound simultaneously, but in reality be headed due west which is straight toward State Route 666 just on the other side of Wytheville. As we passed through Wytheville proper, we saw several very interesting road signs which included a Regional Visitor’s Center sign as though welcoming visitors from another galaxy, and a number of blanked out road signs leading one into unknown realms. Looking up at the beautiful blue sky with its fluffy white clouds lined in silver-gray, it was hard to imagine that just 25 years ago UFOs were flying the skies overhead. Maybe they still are. Wytheville had at least three road signs that were blown over, including one which seemed to point straight up at the sky. 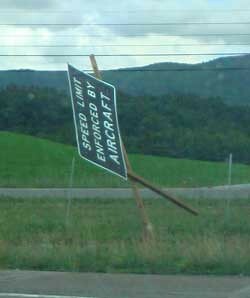 It said: Speed Limit Enforced By Aircraft. Surely they didn’t expect to curb the acceleration of a speeding UFO with such a sign? One could easily imagine a UFO full of laughing aliens buzzing the sign and blowing it over with their tailwinds. We entered the realm of the bizarre Wytheville road signs just as the song Signs from the Five Man Electrical Band came on the air with its warning that “you ain’t supposed to be heeeere…” The Signs song was followed by the Styx song Come Sail Away about a gathering of angels that climbed aboard their starship and headed for the skies. I kid you not, both of these songs played just as we were passing through Wytheville and became part of our home videos of the journey. Sailing up into the sky is apparently a common pastime in Wytheville, which is actually pronounced “with-ville” by the locals. Wytheville is the home of the Chautauqua Festival which began in 1985 just two years before the UFO flap and has taken place every year since. 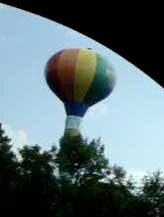 The festival features hot air ballooning which must be why the water tower is painted to resemble a giant hot air balloon complete with a basket painted underneath. The pattern reminded me of a colorful beach ball. With its location in the foothills of the Blue Ridge Mountains, hot air balloonists would surely enjoy a scenic ride. If you wanted to drive up into the Blue Ridge Mountains by car, you could take State Route 666 which was just outside the Wytheville border. Also known as Hogback Road, it forms the upper-right portion of a Y-shape with Swallow Hollow Road being the other fork. 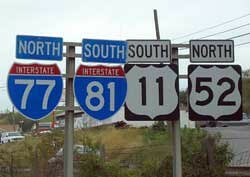 Route 666 crosses I-81 and snakes southward until it dead-ends into Old Stage Road. On the north end it seems to dead-end at Black Lick Road but farther north, the map shows a loop which includes an unconnected portion of Route 666. It’s just another anomaly on the journey through Wytheville. So here we have the realm of the devil converging with a wave of UFO sightings at a wrong-way concurrency of roads that takes you into virtually every direction at once. Apparently the locals wanted to avoid this convergence, as we witnessed a mass exodus of vehicles at Exit 72 just before driving through Wytheville. They were all heading north onto I-77 toward the Blue Ridge Mountains. 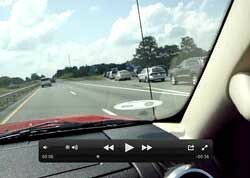 As I-77 would not have taken us home, we were obliged to stay our course southward on I-81. I expected to see cute alien signs along the road with Wytheville embracing its otherworldly fame much as Roswell, New Mexico had done, but from the interstate no such signery could be seen. I also expected to see a genuine UFO as surely they would sieze the opportunity to reconnect with me as I passed through. As Wytheville disappeared into our tail fumes, we passed the community of Rural Retreat just 12 miles down the road. Past that was a sign for Hungry Mother State Park, whose conference center was named Hemlock Haven. 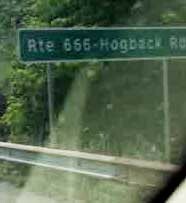 The state of Virginia might not have been known for the Salem Witch Trials but it sure did embrace the various emblems of witches and demons with names such as Salem, Hemlock, and Route 666. I looked up the naming of Hungry Mother park to find that it was indeed named after a mother and child who’d been kidnapped by Indian raiders and escaped. Molly Marley wandered through the wilderness with her child, eating berries until she collapsed leaving the child to wander alone. The first words that the child uttered upon finding other people were “Hungry Mother,” giving name to the area. I don’t recall if we saw a sign for the unincorporated community known as Mouth of Wilson, but I did see it on the map. Mouth of Wilson took its name from a surveyor named Wilson who died and was buried in a creek, which then took his name becoming known as Wilson Creek. The last sign we saw before exiting Virginia was a sign for Gate City, which by our space alien translation became the location for a gate to the stars, or Stargate, being immersed in certain sci-fi shows of similar fame. We entered the city of Bristol, Virginia, and then we were in Bristol, Tennessee waving goodbye to the UFO road through Virginia. Apparently the city of Bristol straddles two states with the state line running right down the center of the main road which is named State Street in their common downtown district. Its main claim to fame is having the official recognition by Congress as being the birthplace of country music. Bristol showcased the Carter Family which included June Carter Cash, wife of Johnny Cash. The talented June Carter Cash was also a cousin of President Jimmy Carter, the president who reportedly witnessed a UFO over Georgia in 1969. He did not believe that it was an alien spacecraft based on his own knowledge of physics, though the description matches a number of UFO sightings. While there were several other witnesses, they did not file official reports and the only witness to “remember” the incident when questioned called it a “weather balloon.” Subsequent investigations by researchers, including an outspoken UFO skeptic, declared it to be a sighting of the planet Venus. Jimmy Carter was an amateur astronomer and stated specifically that he did not believe the UFO to be the planet Venus. He pledged that if he became president, he’d “make every piece of information this country has about UFO sightings available to the public and the scientists.” Once elected, however, he failed to keep that promise. Instead he distanced himself from the issue of disclosure stating “defense implications” as his reason. As for his own sighting, Jimmy Carter later concluded that it must have been a military craft of our own from a nearby base. He stated that he did not believe that extraterrestrials had visited Earth, and denied rumors that the CIA had refused to give him information on UFOs. Imagine that. The story of my multiple UFO sightings is told in the book Alien Nightmares, which went live the week before we made this trip. One chapter mentions the Wytheville Flap of UFO sightings that had taken place in this very location decades earlier. Read it if you dare, but don’t read it before you go to sleep! This entry was posted in Gypsy King RV blog, Road Trips, UFOs and tagged Road Trip, travel, ufos, UFOs Virginia. Bookmark the permalink.